The Mug Race is billed as the "worlds longest river race" for sailboats, and I haven't heard anybody dispute that title. It is sponsored by the Rudder Club of Jacksonville, and has been a standard spectacle for many years. The May 2018 Mug Race will be the 65th annual one. The race starts in Palatka on the first Saturday in May, and the course runs north for 38 1/2 miles on the St. Johns River to the Buckman Bridge (I-295) just south of Jacksonville in Orange Park. The boats are divided into classes, and no sailboat can have a mast higher than 44 feet because that's the clearance of one of the bridges along the route. It's an unusual race. The slowest boats start first and are followed in succession by the faster classes. This is called a pursuit race. For example, a heavy old clunker sailboat might start at 7:00 am and be followed 15 minutes later by a slightly faster vessel, and so on. 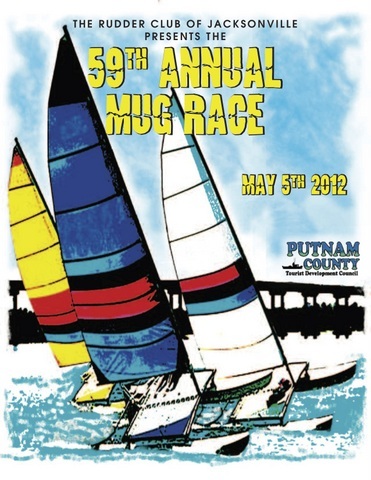 The Mug Race Usually Begins at 7:00 a.m.
Like any other sailboat race, it is forbidden to use your engine. You can, however, use an oar if the wind dies down. You can also put one swimmer in the river to tow the boat if needed. The fastest any boat has ever made the trip is just under 3 hours. That was a catamaran on a day when the wind was perfect and everything went absolutely right. Typical times are much longer, sometimes 10 to 12 hours or even more depending on the wind and vigor of paddlers or swimmers. Some boats don't even finish and haul out somewhere along the way. This is Florida; some days are windy, some are not. Some days are windy and rainy; other days are blistered by the hot May sun. There are prizes for first to finish, first to finish in class, etc. Just finishing the race, especially on a windless day, is a real achievement. If you can find a friend with an outboard motor boat, it's great fun to watch the race from the water. It's important to stay out of the way of the racers, but you will have fun watching the antics. There are also vantage points along both banks of the St. Johns River where you can watch the fleet go by.